With the growing disgust toward multimillionaire professional football players kneeling, scowling, sitting and hiding during the National Anthem and the honoring of our flag, it's refreshing to see a group of high school kids stand not only for the US Flag, but the Christian Flag as well. When the angry atheists demanded the Christian flag be removed---the kids took action. And: In follow up to my article yesterday regarding the Clintons and the Obama Administration colluding with Russian operatives and giving Russia 20% of all US uranium, there is a new timeline created by a veteran reporter and journalist. First, the follow-up. Journalist Michael Chapman has created a timeline regarding the Clinton's and Obama Administration's collusion with Russian operatives and how much more money was directed to the Clintons than previously known. I mentioned yesterday that Bill had received $500,000 for a single speech, but the amount directed to the Clinton Foundation is stunning. It is now known that the amount exceeded $35 million---probably more. This is Chapman's article and timeline. If you are a Christian, read this and smile. With the US flag, the Texas flag also flies. And so does the Christian flag. For now, the angry atheists from Wisconsin are only trying to get rid of the Christian flag. Todd Starnes with Fox says, "The Freedom from Religion Foundation, a Wisconsin based group of atheists, agnostics and freethinkers, sent a letter to the local school board demanding the flag be removed." They claim having the "Christian" flag displayed by the school "confers government endorsement of Christianity, in violation of the Establishment Clause." The school superintendent told the local news they are reviewing the atheist's letter and thinking about it. While the school thinks and considers, the teenagers have acted. They've decided to stand up to the atheists. 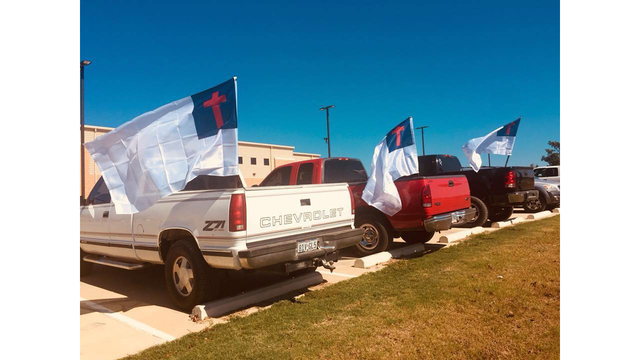 Several kids purchased their own Christian flags and mounted them in the back of their pick-up trucks. It's a beautiful thing to see the trucks pulling into the parking lot and parking with Christian flags waving in the breeze. The other night, the school board had a meeting with local residents. It appears the adults feel much like their kids. They told the board the "The Freedom From Religion organization has a distorted and inaccurate view of the separation of church and state in the First Amendment." Laurie Gaynor, co-President and co-founder with her husband Dan Barker (a former evangelical pastor) of the atheist Freedom From Religion Foundation, called the school displaying a Christian flag, "an egregious violation." Despite the call for its removable, as of yesterday, the Christian flag was still waving, along with those in the pick-up trucks. One resident told KLTV regarding the atheists, "I'd like to say that their viewpoint is probably void and alien to that of our Founding Fathers." Shaine Snyder and others told KETK, "If God is challenged, He is up for the challenge---and obviously so are those who love and serve Him". It's interesting that Laurie Gaynor and others like her see the display of a Christian Flag as such an "egregious act." It is the letter Thomas Jefferson wrote to the Danbury Baptists assuring them the government could not interfere in their ministry and affairs that is most often referred to regarding the "Wall of Separation." However, the letter is pretty clear Jefferson was using the "wall" analogy to emphasize that the government is shut out of the church. Secular progressives have stood that truth on it's head, revising the meaning of Jefferson's words and intent to be a useful tool to silence the church in the public square. To messers. Nehemiah Dodge, Ephraim Robbins, & Stephen S. Nelson, a committee of the Danbury Baptist association in the state of Connecticut. Believing with you that religion is a matter which lies solely between Man & his God, that he owes account to none other for his faith or his worship, that the legitimate powers of government reach actions only, & not opinions, I contemplate with sovereign reverence that act of the whole American people which declared that their legislature should "make no law respecting an establishment of religion, or prohibiting the free exercise thereof," thus building a wall of separation between Church & State. Adhering to this expression of the supreme will of the nation in behalf of the rights of conscience, I shall see with sincere satisfaction the progress of those sentiments which tend to restore to man all his natural rights, convinced he has no natural right in opposition to his social duties. I reciprocate your kind prayers for the protection & blessing of the common father and creator of man, and tender you for yourselves & your religious association, assurances of my high respect & esteem. It is inconceivable that Jefferson who, along with other Founding Fathers, advocated for and attended Sunday Christian Church services in the US Capitol for years, would be advocating for a separation that somehow caused the Christian Church to be unwelcome on government property. He didn't. Neither did his colleagues who were also Founding Fathers. David Barton has written a documented overview of this matter. Take a few minutes and read it. The kids in Texas, and their parents have a clear understanding of the original intent of our Constitution, and those who framed it. Be Informed. Be Bold. Be Vigilant. Be Prayerful. This is the best news we have seen this year…perhaps for many years. Why, because Christians are actually standing boldly for TRUTH. This is both absolutely biblical and proper, but unfortunately it is a brand new concept to most Christians. For years now we have been reverently quiet in our desperation and self-righteous muffled judgment of the growing violations to Jesus, God the Father, and our religious freedoms. FINALLY, young Christians begin to set the example for us in their courageous move to shamelessly glorify our Savior and the nation He allowed to prosper for His glory! -Ps 138:3 When I called, you answered me; you made me bold and stouthearted. - Prov 28:1…wicked man flees though no one pursues, but the righteous are as bold as a lion. - 2 Cor 3:12 Therefore, since we have such a hope, we are very bold. I revealed myself to those who did not ask for me." - Ex 14:8 Pharaoh king of Egypt, so that he pursued the Israelites, who were marching out boldly. - Acts 4:31 And they were all filled with the Holy Spirit and spoke the word of God boldly. - Acts 9:28 speaking boldly in the name of the Lord. - Acts 13:46 Then Paul and Barnabas answered them boldly: "We had to speak the word of God to you first. - Acts 14:3-4 …speaking boldly for the Lord, who confirmed the message of his grace by enabling them to do miraculous signs and wonders. - Acts 28:31 Boldly and without hindrance he preached the kingdom of God and taught about the Lord Jesus Christ. The fallen Evangelical pastor accuses these young brave Christians of an "egregious" action. I looked it up….”gregarious’ is a $10 word meaning "I really don't like it". Let us thank these brave young Christians for shaming us and for showing us the way. Yea!! for these young people! They are bold and courageous and a great example to the rest of us. I have a question - why is a group from Wisconsin concerned about what is going on in Texas? Just looking for something to protest. Looking for something to be offended about.